You’re in the right place to turn your Wild Puppy into your Brilliant Family Dog. For all those annoying little things your companion dog does - like jumping up, grabbing your sleeve, or stealing things. And for the more worrying behaviours owners of reactive dogs have to confront daily - like barking and lunging at any other dog they see - you’ll find lots of answers here. Not just answers, but force-free answers. I love my dogs - as I’m sure you love yours, else you wouldn’t have arrived here - and there’s no need to be hard on them to get what we want. You may have been told, by people you thought knew best, that you have to be heavy-handed - even brutal - to get results. Nothing could be further from the truth. After reading a few of our articles you’ll know that the force-free methods you’ll learn here are thoroughly grounded in science. And this is not a new thing. These facts have been known for at least sixty years. But some tv personalities have found that the quiet, peaceful way to change an animal’s behaviour does not sell advertising space! If you wanted to fix your car’s brakes, I’m sure you wouldn’t go to a tv personality for help. Rather you’d find a qualified mechanic with years of experience. So it is with your dog. And here you'll find both qualifications and those valuable years of experience. Side note: You’ll get lots of guidance here, but if you have an urgent problem of aggression in your dog, please find a force-free trainer right away to help you. The advice you’ll find here can be put into practice straight away. You’ll see your dog change before your eyes! And flushed with success over the first thing you achieve, you’ll be able to work on other things with your dog you thought you could never change. New puppy? New rescue dog? You've struck gold! You can start from scratch teaching your puppy what you’d like him to do, instead of trying to stop him doing what you don’t like. Growly, anxious dog? You will be astonished at the transformation just a few key skills will bring you. Along with a free email course you'll also find a lot of help in the three-book series Essential Skills for your Growly but Brilliant Family Dog. 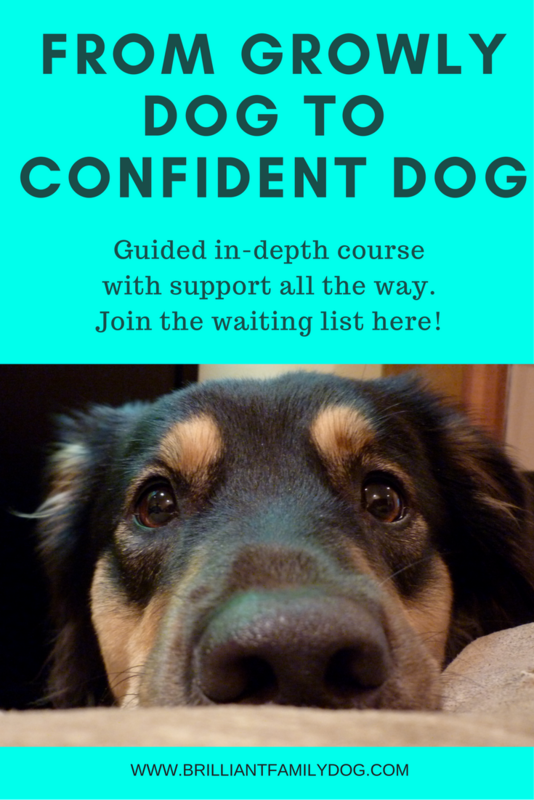 For step-by-step learning, you can also explore the Essential Skills for a Brilliant Family Dog book series for more in-depth coaching. I take you by the hand and I don’t let go till you’ve put your new dog-training skills into effect. And for in-depth learning, with personal tuition from me and support from your fellow students, visit our online courses page. Reactive dog? Anxious dog? Aggressive dog? Calling all Growly Dog owners! Get your free 8-lesson email course and solve them all painlessly!